Need a quick, healthy snack for the kiddos? My kids love these and I feel good about giving them! You can substitute almond/cashew/sunflower butter for the peanut butter, and raisins or dried cherries or cranberries for the dates. 2. dried dates, peanut butter, vanilla extract, and vanilla protein powder to food processor. 4. Slowly add water to the food process and blend until the mixture sticks together. You may need to add more or less water depending on your energy ball dough. 5. Add mixture to a large bowl, using your hands mix in chocolate chip. 6. Form energy bite mixture into 1″ balls and place on parchment paper lined baking sheet. 7. Serve immediately or store in air tight container in refrigerator. YUM. I had to get to work early today and, normally, my go-to breakfast is a piece of toast with two eggs and some mashed-up avocado. But, this morning, I didn’t have time to make anything and I remember thinking on the drive over that it’d be nice to have something I could just grab and GO on days like today. This would be a perfect option! I haven’t used my food processor in MONTHS. This would be a fun thing to try. Thanks for the post! Oh yum! This sounds really good. I do appreciate things that aren’t too hard to make, so no-bake sounds perfect for me! I could really use more recipes like these! I make these often, and they’ve become my go to grab and go out the door breakfast. Imagine my irritation last night when I got ready to make a batch, and found my hubs had snacked on all the chocolate chips! Dude! Yum! I love quick snacks like this. I am ALWAYS looking for great no-bake foods that are quick (but healthy) grabs — especially during busy summers when I don’t want to turn on the oven! Thanks for the inspiration! These sound yummy! My girls would love to not only eat these, but make them. These look great and a great alternative to processed foods for quick snacks. I make a coconut/chocolate version of these at Christmas time, and they are a fav. 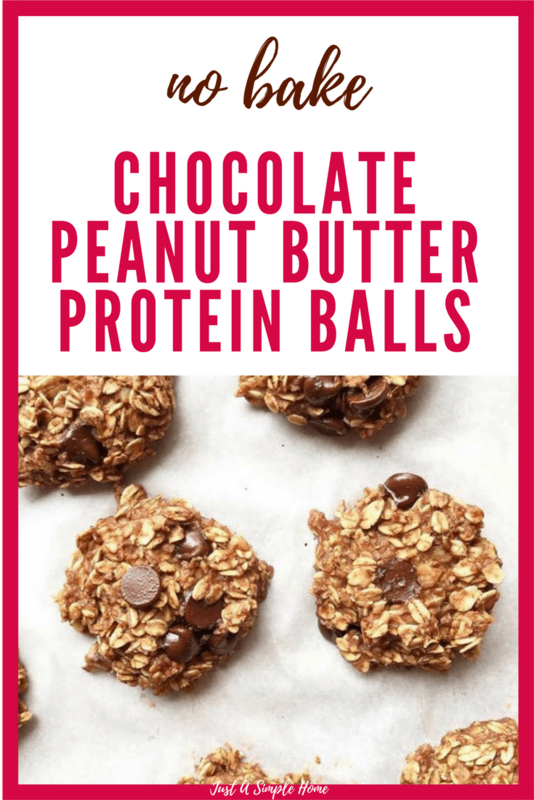 I love the idea of the peanut butter (yum) and adding protein powder. I am 100% going to give these a try. Thanks! These are the bomb! The perfect, filling snack. These look really yummy! I would likely eat them all myself! Yum these look amazing!! I’ll have to try these. I’m always looking for healthy snacks to grab! I am absolutely making these this weekend!! I’ve been looking for a recipe like this and I’m really craving them! These look great! Will be making them very soon. I have been searching high and low for a good protein snack recipe for my kiddos and me. I am going to give these a try this weekend because they sound delish! You had me at Chocolate and Peanut Butter! Now add no bake and I’m like, whoa!!! I definitely will try these!!! These would be great to make and take hiking with the kids! These are such an easy and healthy treat! I can’t wait to try them. They taste delicious, but definitely don”t look anywhere as good as yours.looks like whole oats still, but who cares, they taste great! And I forgot to mention I used a “flax egg (1 Tbsp flax meal mixed with 2 Tbsp. water) instead of the egg, so these are easily made completely vegan too (other than omitting the delicious looking topping). Thanks for the great recipe idea!